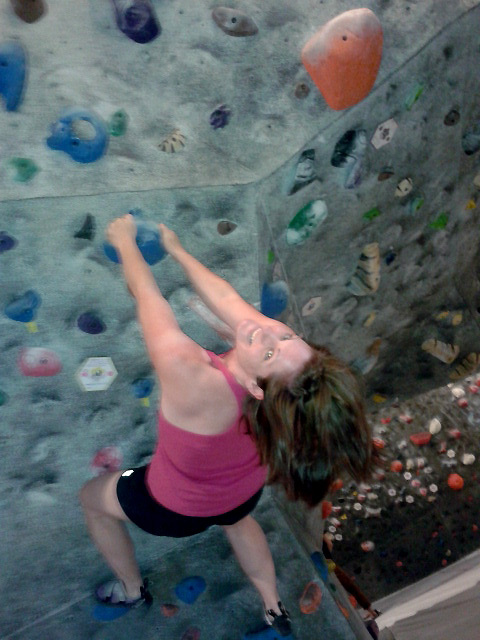 Hello, my name is Kristi and I’m addicted to bouldering. I don’t really know how it happened, but I do blame/thank my friend Leslie who, one day, in such an innocent manner, posted a happy little Facebook status inviting anyone who was interested out to try an “Intro to Bouldering” class at the Hive Bouldering Gym. What the hell is bouldering? I asked myself. If it’s a bunch of people throwing rocks into the ocean that kind of sounds random and fun, I thought. You see, I had just recently returned from an amazing time living in Germany and having a not-so-easy time adjusting to life back in Canada. 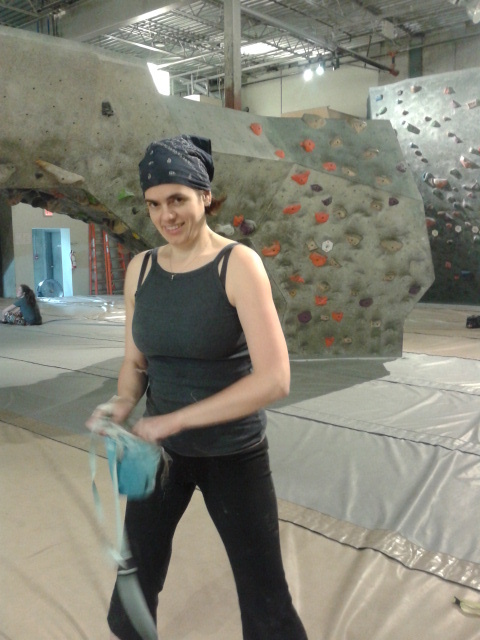 I was on a, “I want to try new things and meet new people and be healthy and find a community” kick and it turns out, bouldering is pretty much the most challenging and awesome hobby I could have stumbled my 30-something and partially in shape body upon. They say that bouldering is the purest form of rock climbing out there – no ropes, just you and the rock and climbs go to about 18 feet (though I have heard crazy tales of 30-40 foot boulders). Leslie had decided to try it out because she realized it would mean she could do this as a solo activity as well as with other people. So, three of us kind of nerdy academic type (with a desire to be fit) gals decided to venture over to the rather sketchy and deserted Industrial Avenue in East Vancouver to give this a go. We had no idea what to expect. 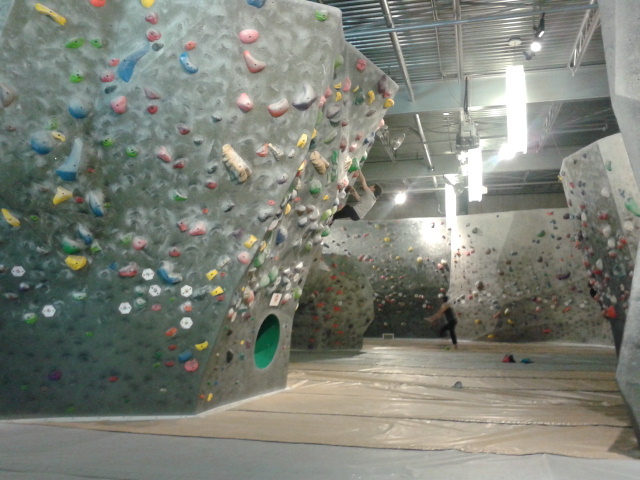 A look at one of the indoor bouldering walls of the Hive. And I can tell you…it’s much scarier than it looks at first. And it looks pretty scary at first. 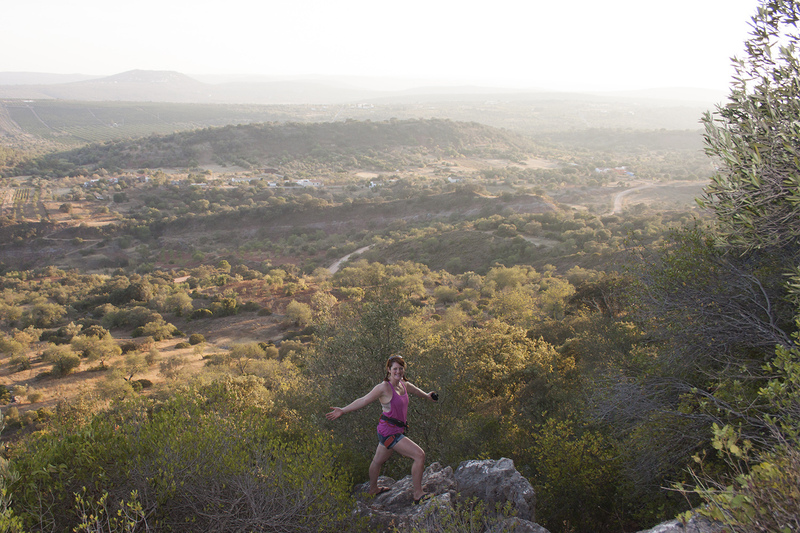 The first thing we learned – climbing is freakin’ hard. Have you ever seen pictures of climbers? If you haven’t you might want to check them out. Even if you aren’t a climber or never will be, you might want to peruse pictures of climbers. They are ripped, they are toned, but not in an overly bulgy-gross way, but in a “holy crap that person is in shape and can hang off a cliff with one finger” kind of way. So, as you can imagine, starting to climb as a woman in your 30s in a mostly male-dominated (though this is changing very quickly) sport with super fit and lean people is….completely daunting. That’s how I knew and know that I really had fallen in love with it. Leslie chalking up to take on a new problem. Despite the fact that I felt so out of shape compared to everyone there (you should know that I did actually run three half marathons last year so I wasn’t completely out of shape when I started), and the fact that every single muscle in my body ached the day after our class, I still kept coming back for more, and still do. I had no idea my body could hurt so much. I’ve tried a lot of different sports in my time and tested my body to the limits many times. The day after my first half marathon I was so sore I walked like a 90 year old woman around my apartment and couldn’t even walk down stairs. After my first time bouldering I could barely wash my dishes. I got home, stuffed my face because I was so ridiculously hungry (I didn’t realize that my muscles were screaming for protein at this point), and attempted to hold something. Maybe it was my dish wand. Maybe it was a pen. Maybe it was really just a piece of paper. I don’t even remember. All I remember is looking at my hand and thinking, “move. MOVE. Just….move! Yes, that’s how sore I was. And here’s the best part. I couldn’t wait to go back. Like… couldn’t freakin’ wait. There was a lot of the word “freakin’” used in my first weeks of climbing. “This is so freakin’ awesome!” “My muscles are so freakin’ sore!” “This problem is so freakin’ hard!” But I digress. The day after our class, Leslie and I texted each other saying something along the lines of, “Are you in pain? HELL YES! Want to go again as soon as possible? HELL YES!” Did we? HELL YES! Before I knew it…I’d found my new happy place. So, at this point you might be asking yourself….so….if it’s SO hard on the body and the ego….why the heck DID you go back? Only those who have fallen in love with climbing can truly understand what happens here. I think it’s something along the lines of discovering an activity that somehow fulfills almost all your needs – intellectual, physical, social and most of all – the FUN. Because…it is so ridiculously fun. Epically fun. You get to climb stuff. And fall off stuff. You get to swing from stuff. You get to pretend you are a kid again. But this time you are doing some really really hard stuff. You are building muscles you didn’t even know existed. You are testing your body and mind to the limits every single time you climb. It’s AMAZING. Do I think everyone should climb? YES. Do I think everyone would want to climb? NO. Do I think you should try it at least once? YES. Sensing a theme here? I’m a bit of a bouldering missionary. And so, only a short four and half months ago my addiction to bouldering began and a whole new world opened up to me, along with a quirky and wonderful new community of people. I hope you enjoy my journey and the tales of the highs and lows of my climbing adventures, how it helps me face the challenges of life and perhaps if I have a couple moments of wisdom you’ll learn some stuff about how to rock your life, even if all you ever do is use the powerful metaphor which is rock climbing.